Indonesia has been an electoral democracy for more than a decade, and yet the political landscape of the world’s third-largest democracy is as complex and enigmatic as ever. The country has achieved a successful transition to democracy and yet Indonesian democracy continues to be flawed, illiberal, and predatory. This book suggests that this and other paradoxes of democracy in Indonesia often assume occult forms in the Indonesian political imagination, and that the spirit-like character of democracy and corruption traverses into the national media and the political elite. 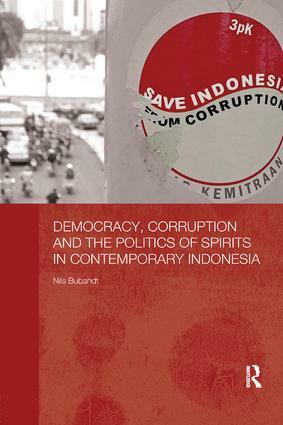 Through a series of biographical accounts of political entrepreneurs, all of whom employ spirits in various, but always highly contested, ways, the book seeks to provide a portrait of Indonesia’s contradictory democracy, contending that the contradictions that haunt democracy in Indonesia also infect democracy globally. Exploring the intimate ways in which the world of politics and the world of spirits are entangled, it argues that Indonesia’s seemingly peculiar problems with democracy and spirits in fact reflect a set of contradictions within democracy itself. Engaging with recent attempts to look at contemporary politics through the lens of the occult, Democracy, Corruption and the Politics of Spirits in Contemporary Indonesia will be of interest to academics in the fields of Asian Studies, Anthropology and Political Science and relevant for the study of Indonesian politics and for debates about democracy in Asia and beyond.